Size: 655 sq.ft. - 2450 sq.ft. 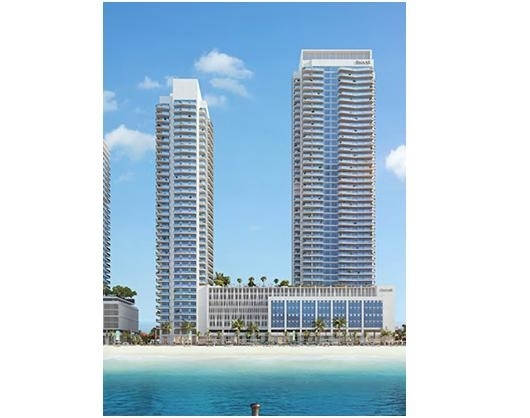 A gated private Island "Emaar Beachfront" is adding a new development of two high rise towers. The Emaar has named the project Marina Vista standing over about 3 acres land parcel. This will be the third project within Emaar Beachfront community launched recently in 2018. Emaar Beachfront is an exceptional residential community with 27 exceptional towers. Residences at Emaar Beachfront community are like no other where the residents will be offered stunning 360 views of Dubai & Arabian Sea. Emaar Marina Vista is a mixed use project with residential homes, Commercial Spaces and Office spaces. The project featuring 1 to 4 Bed apartments that contains world class external amenities only one step away from the private beach apartments, also it has several internal amenities so you can enjoy it daily. The pricing of Marina Vista apartments starting from AED 1,307,888.The work completion of Marina Vista is expected by December 2021. At Marina Vista you are not going to live a common lifestyle you will discover a resort-style way of life with the configurations of 1 BR, 2 BR, 3 BR and 4 BR residential units. Overall the project consists of 680 Units, per floor there are 3 to 4 Units. These towers sit between Pal Jumeirah & Jumeirah Beach Residences, one tower compromise of 27 floors & another tower 37 Units including 6 podium levels. The property sizes ranges from 655 to 750 Sq.ft for 1 Bed apartments, 1105 to 1220 Sq.ft for 2 Bed apartments, 3 Bed apartments between 1540 Sq.ft to 2045 Sq.ft and the 4 bed apartments ranging between 2250 Sq.ft to 2450 Sq.ft. Marina Vista towers are crafted as contemporary character with floor to ceiling windows inspired by Miami lifeway. This destination is for those who dream to have unique experience and love water sports. The most valuable construction company Emaar Properties got incorporated in 1997. Emaar Properties is known as pioneers of master plan development in Dubai. The company has proven their interest in performing Residential Projects, Hospitality Projects, Shopping Malls, Retail & Leisure spaces. Emaar Properties has been honoured with a numerous local awards, regional awards and international awards for the projects like Burj Khalifa, Green Building at The Dubai Mall, The Palace Downtown Dubai and as many as such. Till date it has delivered well established communities - The Greens, The Meadows, Downtown Dubai, The Hills, The Lakes, The Springs,Arabian Ranches, Dubai Hills Estate, Dubai Creek Harbour,The Opera District, Emirates Hills, Emaar Towers, Emaar South & Dubai Marina.There many under construction projects of Emaar Properties which are already being appreciated by local & international people. The project is located at Dubai Harbour has an exciting new master development by Emaar called Emaar Beachfront. The apartments of Marina Vista are facing towards the unparalleled site of Crystal Blue Waters of The Arabian Gulf & The Palm. Emaar Beachfront offers the residents an exclusive access to a 750 Metre long strip and convenient access to Sheikh Zayed Road. Emaar Properties has launched 3 projects – Beach Vista, Sunrise Bay & Marina Vista in Beachfrontand more to be launched in the future. The community adds extra features as it is a tourism driven destination, upcoming F&B and Retail, upcoming Cruise ship terminal which will accommodate 1.2 Million passengers yearly and the iconic architecture Dubai Lighthouse. The Educational institutes, hospitals, Shopping Malls, Metro Stations and other communities are right outside the Emaar Beachfront community and can also be access through futuristic public transport facility. Marina Vista towers are getting shaped in Beachfront Community at Sheikh Mohammed bin Rashid Al Maktoum's Logo Island which is the part of Dubai Harbour, Dubai, UAE. Emaar Marina Vista comes with the finest amenities - Reception and Concierge service, High speed internet, Video security of smart technology, Lounge area, Meeting room, Gymnasium, Steam & Sauna room, Retail Space, Infinity Pool, Pet Friendly Zone, Elevators, Private Parking spaces, Terrace, Communal Garden, a pedestrian bridge, Jogging track, cycling track and many more.